VANCOUVER, BC – The Winter 2016 issue of What’s Brewing, an electronic publication subtitled “The Journal of BC’s Craft Beer Movement”, is now available for download and online viewing. Originally founded in 1990 as a bimonthly newsletter for CAMRA BC, What’s Brewing was relaunched in 2015 as a quarterly e-magazine with contributions by beer writers and drinkers from across British Columbia. 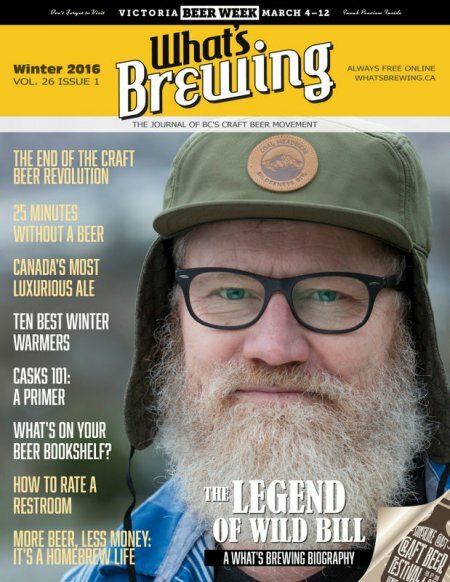 Articles in this issue include an extensive profile of pioneering local brewer ‘Wild Bill’ Herdman, analysis on the overall state of BC’s craft brewing industry, beer scene reports from various regions in the province, and much more. The new issue of What’s Brewing – as well as many back issues – can be read online via the Issuu platform. The full issue can also be downloaded as a PDF, and separate articles are being posted to the magazine’s website.